All brides have enough to worry about as they plan their perfect wedding. 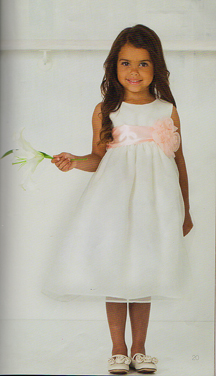 That’s why at Hansel & Gretel we make shopping for flower girl dresses easy. When a bride comes in looking for dresses we are able to show them a large selection of dresses in the store in sizes from infant to size 7. They are able to see the actual dress, feel the fabric. and if the child is with them we can try them on for size. Even if the child can’t come in we can choose a dress size from the child’s measurements. Dresses come in white and ivory with an impressive selection of sash colors and sash styles to choose from. We have actual fabric swatches in the store so colors can be matched with the bridesmaid’s dresses. We also have dresses in color. If she’s having a ring bearer we have suits and tuxedos for boys starting in infant sizes also. Once the dress is selected we also help the bride select shoes, hair bows, jewelry, tights or socks, and even flower girl books. Truly one stop shopping. When a bride leaves Hansel & Gretel so many have told us how easy it was. We have the “That Was Easy” button from Staples. We’ve done weddings for one flower girl up to seven flower girls in one wedding. We have companion style dresses for both older and younger girls. All of the dresses are ordered to get the exact size and color a bride has chosen and they take about four to six weeks to come in. We have never missed a wedding date. If necessary a dress can be rushed or even overnighted for a small fee. It’s our privilege to be a part of their special occasion.